The repair time depends on the order situation. Please ask for the repair time when delivering the instrument. We guarantee for the performed repair for 6 months. A guitar setup includes adjustment of the neck (truss rod), check and adjustment of saddle, bridge compensation and string action. 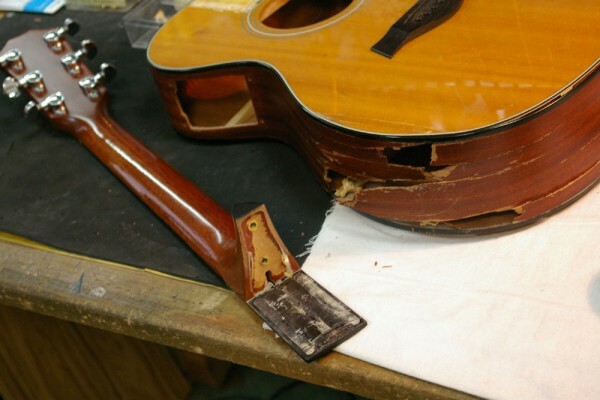 Prices for (partial) refrets include fret material and setup work. Refrets can be made using your desired fretwire dimensions. We can alter fretboard inlays, make new ones or even inlay your individual design. Inlays can be performed using mother-of-pearl, abalone or selected wood types. Furthermore we are able to inlay initials, names or even hand-written signatures. A great multitude of options in inlay techniques is available. In this area there is a wide range of possiblities. Please contact us via e-mail. We have a wide selection of electric guitar pickups. We are capable of performing lacquer works, even if complex or elaborate, in our varnishing facility using nitro or polyurethane lacquer. Furthermore we offer french polish using shellac. Partial finishing and lacquer restoration on request. Please inquire for shipping modalities and repairs, which are not listed, via phone or email. Our workshop is located approximately 6 walking minutes from ‚Rosenheimer Platz‘. Tram line 15 or 25 will take you from ‚Rosenheimer Platz‘ to Regerplatz‘ directly to our shop. Take busline 62 from ‚Sendlinger Tor‘ or ‚Ostbahnhof‘ and alight at ‚Regerplatz‘. You’ll instantly see our shop at the corner. 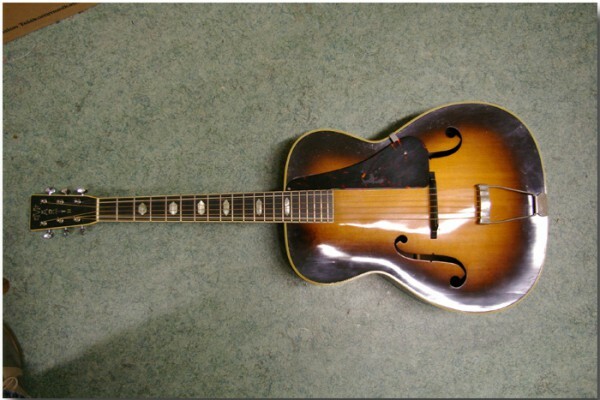 A customer wants his Archtop Martin guitar convert into a Flattop Steel-String guitar. Here are the individual steps. 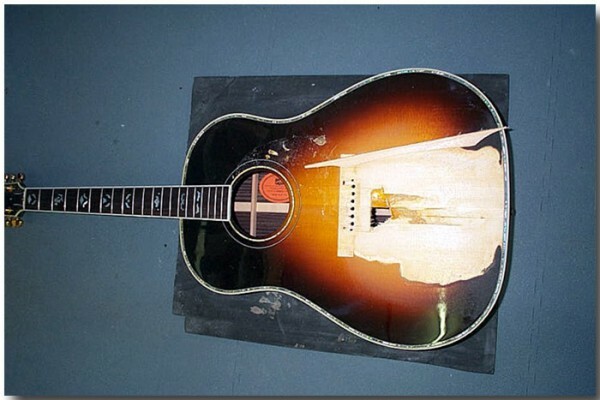 A Gibson Acoustic Guitar with a haevy top damage. 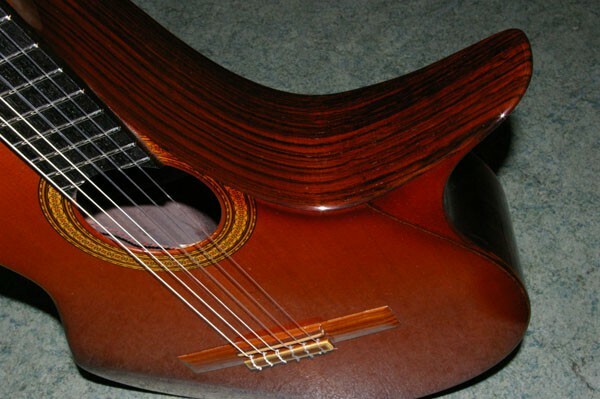 A customer wants his classical guitar radical modified. 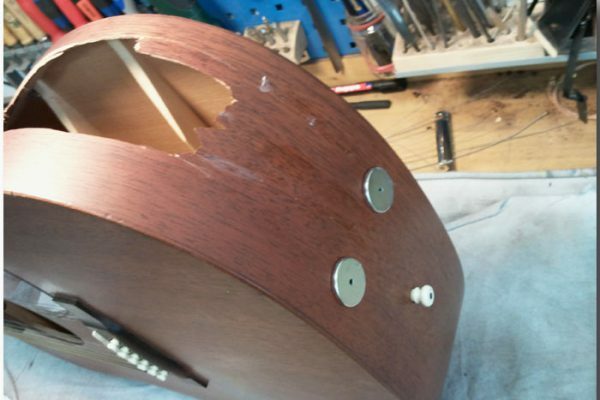 We should install a bevel and very deep cutaway. This has been one of our heaviest damages, but everything has become fine. You are looking for a Music Teacher?